Toothache, shooting pain when you take a sip of cold water, infection around the tooth? If any of this describes your current situation, you need to contact your skilled restorative dentist, Rodney L. Allen, DDS, to find out more about Brownstown root canal therapy. While these restorative dental treatments have a reputation for being painful, they actually allow our team to relieve your toothache and dental sensitivity and save a tooth that may otherwise be lost. If you hear that you need a root canal, take a deep breath. We’re going to help you relieve pain and get the smile back on your face. A root canal is a treatment that repairs teeth when decay or damage access the very inner layer of the tooth called the pulp. The tooth’s nerve is housed within the pulp, and when it’s accessed, the result is painful toothache and dental sensitivity. To save the tooth from removal, we’ll need to perform a root canal to remove the damaged tissues. How are Root Canals Completed? Root canals are actually very straightforward procedures. We begin by numbing the area around the tooth to be treated. Then, a hole is drilled into the pulp layer of the tooth. We extract the pulp, nerve, and any other damaged tissues. In some cases, we will provide oral and/or topical antibiotics at this point to avoid infection before we complete treatment. 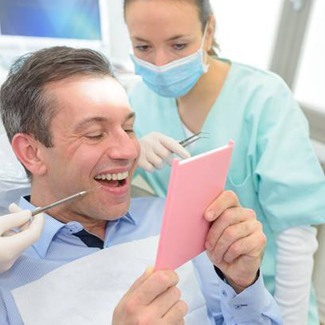 Once you are free from infection, we’ll refill the tooth with a biocompatible substance. The access hole is resealed with a composite filling material. Typically, we also place a dental crown to protect and strengthen the root canal treated tooth. Following your root canal treatment, you will likely feel immediately better, but we still recommend taking it easy for the first few days after treatment. Avoid chewing with the part of your mouth around your root canal treated tooth, eat softer foods, and avoid extremely hot or cold foods and drinks. You should experience almost immediate relief from toothache and dental sensitivity, but if you do continue to experience tooth pain or your discomfort or sensitivity increases, it’s time to call our office. These can be warning signs of serious complications. If we’ve prescribed antibiotics, make sure to complete your entire course of medication to avoid infection and ensure you make a full recovery.